Russian cosmonauts Vespero fit squarely in the 70's progressive/space rock camp, though with a pronounced psychedelic veneer that instantly reminds one of Jefferson Airplane circa Surrealistic Pillow and After Bathing at Baxter's. Lead singer Natalya Tjurina's whirling dervish vocal theatrics have more than just a hint of Grace Slick's icy acid princess delivery (though filtered through Lene Lovich's punkgypsy hypersoprano) and guitarist Alexander Kuzovlev's middle eastern-influenced licks and phrasing deftly echo Jorma Kaukonen's modal explorations during the Airplane's Haight-Ashbury blitzkrieg. On the other hand, the dreamy "Instruments of the Roads" has the aura of a lost Amon Düül II track from Carnival in Babylon. Elements of Gong and early Pink Floyd are also evident on the six songs that make up Foam. But perhaps Vespero's closest kindred spirit is American space explorers Architectural Metaphor. Like Arch Met, Vespero mines the past treasures of the psychedelic time capsule while adding their own distinctive cosmic ore to the smelting process. "Figures" is an exemplar in this respect. Floydian organ swells and Gong-inspired synthesizer whooshes propel the song outward beyond the asteroid belt. The dual drum/percussion technique Vespero employs throughout Foam gives the group a distinctive sound that sets them apart from their iconic father figures and makes them more than merely the sum of their influences. The group really takes off into interstellar space on the title track "Foam." This lengthy improvisation pulls together all the essential threads of the Vespero sound: haunting female vocals, droning synthesizers, propulsive drumming, modal-tinged guitar-all of which reminds the listener of what it must feel like to be inside the great pyramid at Giza as it lifts off its base and floats skyward on a no-return trip to the Pleiades Cluster. Russia is apparently becoming something of a breeding ground for neo-space rock and along with Space Mirrors, Vespero seems to be leading the way for a divine invasion into American air space. 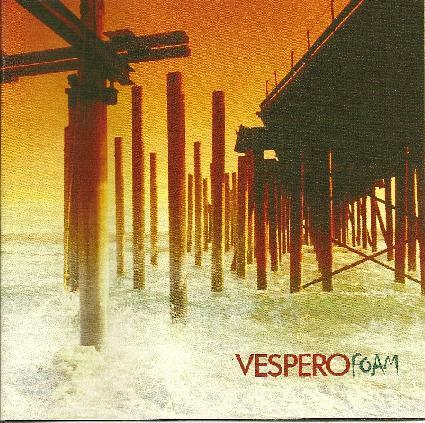 For more information you can visit the Vespero web site at: http://www.myspace.com/vesperomusic. Visit the Trail Records web site at: http://www.trailrecords.net.